Continental, a technology company and automotive supplier with its North American headquarters in Auburn Hills, Monday showed how a driverless vehicle could be used to stage and deploy delivery robots that would take packages to consumers who may not be able to physically receive them. The system would use the Continental Urban Mobility Experience (CUbE) and delivery robots for more effective and efficient distribution of goods. Driverless vehicles such as CUbE, Continental’s autonomous electrified development platform, are generally considered a solution for urban first- or last-mile mobility. Market estimates show the need to transport goods will outpace the need to transport people in densely populated areas. “With the help of robot delivery, Continental’s vision for seamless mobility can extend right to your doorstep,” says Ralph Lauxmann, head of Continental’s systems and technology, chassis and safety division. “Our vision of cascaded robot delivery leverages a driverless vehicle to carry delivery robots, creating an efficient transport team. As goods and parcel delivery to residential areas grows, delivery cost per hour is gaining importance. Automated goods delivery is forecasted to provide an answer for up to 80 percent of all business-to-consumer deliveries, according to multiple research sources, says Continental. “Industrializing the automation of goods delivery requires reliable, robust, high-performing and best-cost technology – a mix perfectly reflected in the automotive equivalent of automation. It is this very profile of expertise that has made Continental one of the industry-leading suppliers of advanced driver assistance systems and vehicle automation,” says Lauxmann. Driverless vehicle technology can be scaled for robot manufacturers’ requirements. Driverless vehicles are expected to be used 24/7 and will be able to deliver goods outside of peak use hours, says McClain. Many deliveries are and will be made during the work and school day. 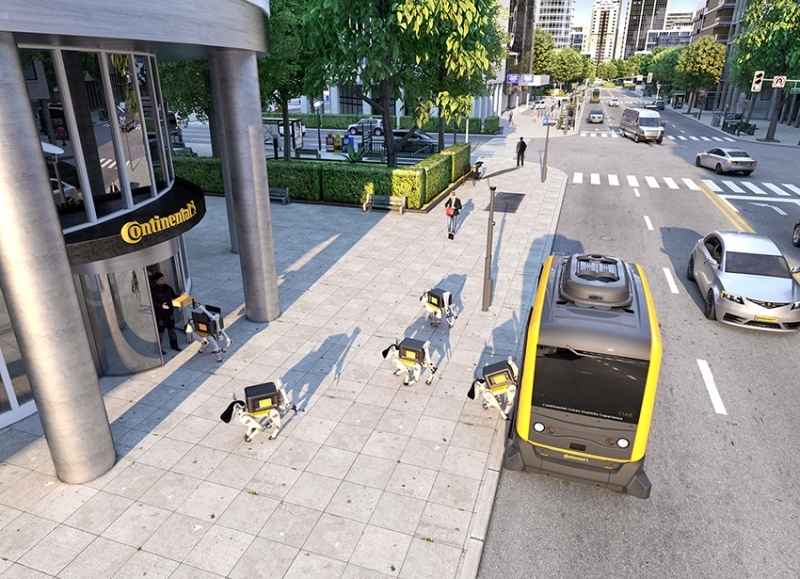 Continental’s booth at CES 2019, a technology exhibition in Las Vegas, will showcase its recent driverless delivery ideals. The company’s global headquarters are in Germany.